Wednesday, Apr. 17, 2019, 1:30 – 3 p.m. Though located far away from the center of the Islamic world, the huge Muslim population of Indonesia has shown for centuries strong affiliation to the Sunni Middle East. It was largely established on substantial transmission of Islamic knowledge and ideas from the Middle East to the Islamic “periphery” of Indonesia; very rarely, if at all, have such ideas and knowledge flowed in the opposite direction. elections on April 17, 2019. 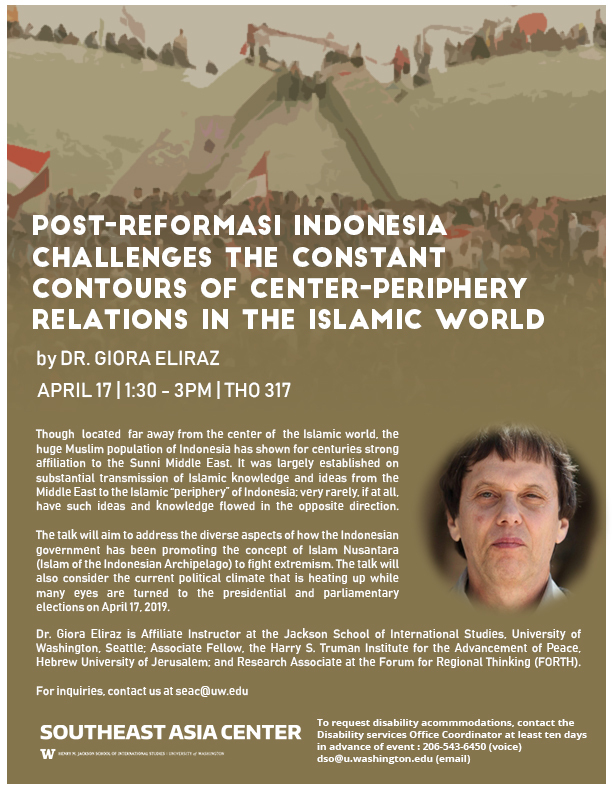 Dr. Giora Eliraz is Affiliate Instructor at the Jackson School of International Studies, University of Washington, Seattle; Associate Fellow, the Harry S. Truman Institute for the Advancement of Peace, Hebrew University of Jerusalem; and Research Associate at the Forum for Regional Thinking (FORTH).